This recording is last portion of Dr. Burkinshaw’s appearance on the CBC Radio Show “BC Almanac” continuing from Aud. 14b. He answers a few questions about Christ’s worldview and the relationship between fundamentalism and the KKK. The recording then cuts to a different episode of the same program which features a discussion on off-road vehicle legislation in BC. There is also an interview with journalist Andrew Cohen and his book “While Canada Slept.” There is a strong static noise through the entire recording. This is the first half of Bob Burkinshaw’s interview on the CBC radio program "BC Almanac." 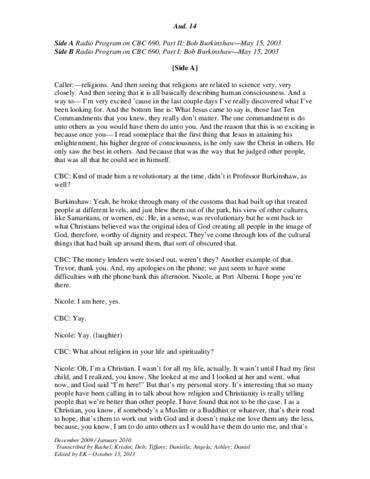 The interview begins with an analysis of church attendance and religion in BC and the Fraser Valley. Burkinshaw discusses the historic irreligiousness in British Columbia. Burkinshaw then proceeds to answer questions asked by various callers on a wide range of topics having to do with religion. He argues that there is a spiritual hunger in the province and people are searching for meaning. Burkinshaw briefly discusses cloning with one caller and the ambiguity of census data with another. They are joined by Reverend Koten Benson of the Lion’s Gate Buddhist priory in Vancouver. The recording is continued on Aud. 14a. See F 41 for transcript.